We open the series with Andrzej Wajda's most recent film, screening in this year's 32nd Portland International Film Festival (February 5-22). Following the Soviet Union's invasion of Poland in 1939, nearly 15,000 Polish army officers, police, gendarmes, and civilians were taken prisoner by the Red Army and executed at three different sites, the most famous of which was Katyn Forest. In 1943 the Germans announced the discovery of the Katyn graves. The Soviets denied the killings, fabricating evidence that blamed the Germans. In Communist Poland, asserting the truth about Katyn resulted in persecution by the Secret Police. KATYN does not tell the story of the massacre, but rather of the families that had to live with both the pain of the crime and the Soviets' lies. Weaving together several of the victims' stories, KATYN is the culmination of Wajda's lifelong wish to make a film on a most personal subject: his father was one of those murdered at Katyn. "You could go in knowing nothing of the massacre and come out wanting to know everything. "—The New Yorker. 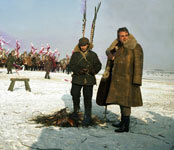 This year's Polish submission for the Best Foreign Language Film Oscar. KATYN is showing as part of the 32nd Portland International Film Festival. Tickets go on sale January 28. An unforgettably vivid depiction of the last days of the 1944 Warsaw uprising against the German Nazis, KANAL was co-awarded (with Bergman's THE SEVENTH SEAL) a special jury prize at the Cannes Film Festival, establishing Wajda as a major new international film talent. 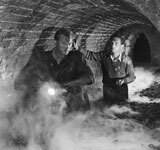 His second film—and the second part of his war trilogy—features a rich mosaic of meticulously combined narratives, following a band of surviving Polish Home Army soldiers that takes to the sewers to avoid capture. Unable to refer to the fact that the Soviet Army was waiting just across the river while the Germans wiped out the non-Communist resistance, Wajda portrayed the insurgents with unaccustomed sympathy. 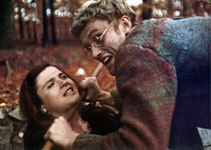 Five years after this riveting excursion into the "underneath" of history, the Polish Communist Party announced that there was no place for films like Wajda's in Polish cinema. "Sensational filmmaking meets existential masterpiece."—J. Hoberman, The Village Voice. The extraordinary final installment in Wajda's war trilogy, ASHES AND DIAMONDS is a true landmark of postwar European cinema. With a screenplay by Jerzy Andrzejewski, based on his novel, the film is set on the last day of the war and the first day of peace, when a young Home Army soldier is assigned to assassinate a Communist official. More important than the political nuances of a Poland poised between past and future are the moral dilemmas faced by individuals in a time of transition, always treated with great humanity by Wajda. Zbigniew Cybulski's way-cool performance—complete with dark shades, match cocked between his teeth and easy banter with the ladies—earned him the title "the James Dean of Poland." "Many consider it the director's best picture; if you're curious about his work, this is an excellent place to start. "—Time Out New York. Critic's Prize, Venice Film Festival. LANDSCAPE opens with one of the most celebrated sequences in Wajda's work: liberated by the arrival of American troops, the prisoners in a concentration camp stream out of their confines, smash the windows of their barracks, strip and throw their striped uniforms into a roaring fire. Those moments of unimaginable freedom quickly lead to the realization that most have nowhere to go. Their former prison becomes their "displaced persons" camp. Tadeusz (Daniel Olbrychski), an intellectual whose main interest is recovering his books, feels as alienated from his fellow prisoners as he did from his captors. But then he forms a tenuous bond with Nina (Stanislawa Celinska), a young Jewish woman who lost everything and everyone in the war. A poignant, deeply affecting portrait of a world in which displacement has become the natural human condition. 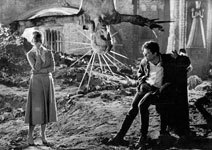 One evening in 1967, Wajda discussed with a friend what a wonderful movie could be made about the life of actor Zbigniew Cybulski. That very night, Cybulski died attempting to jump onto a moving train. The loss was extraordinarily painful for Wajda. Together with a group of close collaborators, he embarked on this deeply personal and introspective film about the cast and crew of a work-in-progress that suddenly loses its leading actor. 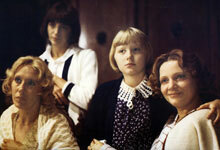 Top stars (including Elzbieta Czyzewska and Daniel Olbrychski) play themselves, and the prominent actor Andrzej Lapicki plays Wajda. The first of his films to be based on his own original screenplay, EVERYTHING FOR SALE maps the shifting borders of art and life, illusion and reality, grief and creation. After a string of hard-hitting political works that roused the censors' ire and brought him into the international spotlight, Wajda deliberately changed pace with this wistful, elegiac, almost Chekhovian recreation of a long-vanished Poland, based on a story by Jaroslaw Iwaszkiewicz. Following the death of a close friend, 40-year-old farm manager Wiktor (Daniel Olbrychski) returns to the village where he spent his youth. Next door, five sisters Wiktor had known have also returned for the summer. The inviting tranquility of the women's lazy summer days can't conceal the sense of sadness that runs through their lives. Wiktor had loved their sister who, unbeknownst to him, has died, and his presence upsets their delicate emotional balance. "You can't go home again" seems to be Wajda's message, as Wiktor's attempt to revisit his youth revives a web of subtle entanglements from which he is forced to escape. Rarely have a film and a social movement so perfectly meshed as MAN OF MARBLE and the workers' union Solidarity: the film came to be seen as the union's international herald. Young filmmaker Agnieszka (Krystyna Janda) explores the life of Mateusz Birkut (Jerzy Radzilowicz), a now-discredited labor hero of the '50s who is remembered only through the statues made of him, which now reside in cellars and storage lockers. Using cleverly created newsreels, interviews, and scenes of Agnieszka's battles with the authorities, Wajda creates a scathing dissection of the "man of marble" and the state that makes and breaks him. The Communist Party was so nervous about the film that they arranged for only party members to attend the premiere, lest there be any applause at the end. "May be Mr. Wajda's masterpiece. "—The New York Times.